Low fat and carbohydrate whey protein isolate to help you build muscle. 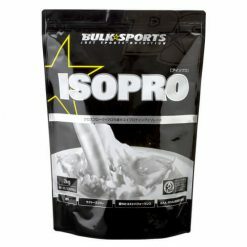 IsoPro Protein Powder is an unmodified protein product with lactose and fat almost entirely removed. For this reason, it is recommended to the user that feels discomfort in the stomach when using a milk-based protein powder. Bulk Sports protein is known for its delicious taste. We have partnered with a world-renowned flavor manufacturer in order to enhance the taste of our protein supplements with minimal use of additives and sweetening agents. For athletes that use Bulk Sports protein several times a day, we recognize the importance of excellent flavor. 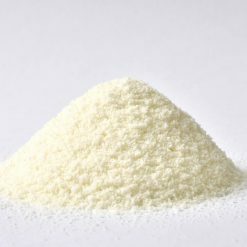 As with all Bulk Sports products, IsoPro Protein Powder is cost effective in addition to being of high quality and good taste. 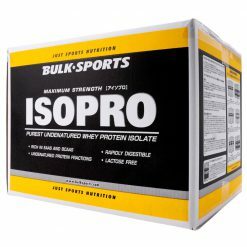 For regular users, IsoPro Protein Powder is also available in a 10kg economy size. Take one scoop mixed into 150-200mL of your beverage of choice. We recommend that you use this product in the morning, either before exercise or immediately after. Take with your meal to increase protein intake.